*** For this review, the folks at Brinsea sent us their Brinsea Ovation 56 Advance Incubator with fully automatic egg turner and digital temperature and humidity control test run. Brinsea Ovation 56 Advance Incubator with fully automatic egg turner and digital temperature and humidity control. Cost: $469.99 on Amazon (Buy here) or (accurate at time of print) $449.99 on Brinsea’s website here. The Brinsea Ovation 56 Advance Incubator with fully automatic egg turner and digital temperature and humidity control is an electric egg incubator with an automatic turning element and forced air heating element. There are 8 egg holders that can accommodate all species of domestic poultry eggs. 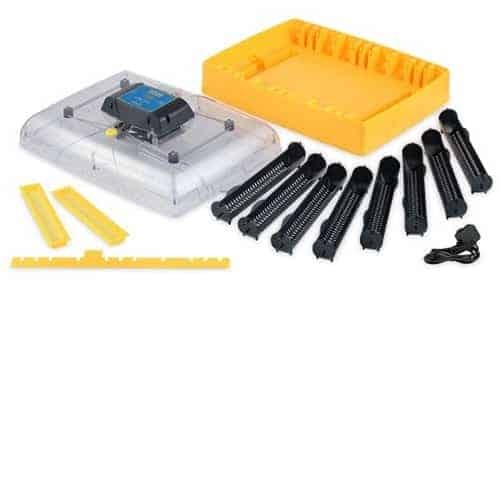 There are also areas for water to maintain the humidity levels. The temperature and humidity are digitally displayed on the top of the incubator. The Brinsea Ovation 56 Advance Incubator comes with a manual that explains how to use it and how to set it up. “The Ovation 56 Advance is a sophisticated, high performance incubator ideal for a wide range of species and applications. The high accuracy digital readout of humidity and comprehensive alarms help ensure high hatch rates. Let’s just say that we gave the Brinsea Ovation 56 Advance Incubator a real run for its money, and it came through with gold stars. We tested it twice, both with duck and chicken eggs (mostly from my brahma chickens). We had to try it twice because on the 18th day of our first test run with 30 chicken and duck eggs, the cat knocked over the incubator and cracked every single egg. Despite this error on our part, our experience with the Brinsea Ovation 56 Advance Incubator was overwhelmingly positive. Setting up the incubator was easy, although I did have to consult the manual to make sure all the settings were accurate. The manual is well written and easy to follow. I selected 30 duck eggs and enough chicken eggs to fill up all the cups. Days 1 – 10 went uneventfully, and I appreciated how easy the Brinsea Ovation 56 Advance Incubator is to use. On Day 10, we pulled out the eggs that did not develop or were never fertile, and left the remainder to incubate. Out of 30 eggs, we pulled out less than 5. In any hatch, some eggs won’t develop, and it’s not a reflection of the incubator. Before the incubator crash, we candled all the remaining eggs on Day 18, and they appeared to have embryos developed enough to hatch. After the crash on Day 18, we had 5 chicks hatch immediately, and they were all healthy, and have lived to tell the tale. We lost the rest of the hatch, but it was no fault of the incubator. The incubator itself was unharmed, which is a testament to its craftsmanship. The second time, we tested the incubator with 15 duck and about 20 chicken eggs. All went as planned, and we loved that we didn’t need to worry about the temperature levels, and adding more water to maintain the humidity was easy. The temperature stayed a constant 99.6 degrees F throughout the entire incubation period, except when we replaced the water in the humidity trays. When the temperature dipped a few decimal places because of the water, the incubator returned to 99.6 degrees quickly. When we removed the top of the incubator to candle, again, the temperature returned to 99.6 quickly. Candling the eggs was easy, although I had to be careful to grasp the eggs tightly to remove them from the turning element safely. We kept the humidity at 55%, and removed the chicken eggs from the turning element on Day 18. The duck eggs remained in the egg cups, which protected them when the hatched chicks rolled around to get their bearings. On Days 18 – 21, all the chicks hatched, and are healthy and now happily running around our farm. Because of the automatic turner, we didn’t have to open the incubator at all while the chicks hatched to turn the duck eggs, allowing us to incubate both types of eggs simultaneously. The duck eggs remained in the cups until Day 28. We removed some duck eggs before the final 3 incubation days (the eggs were never were fertile) and all of the remaining duck eggs hatched on Day 28 and Day 29. 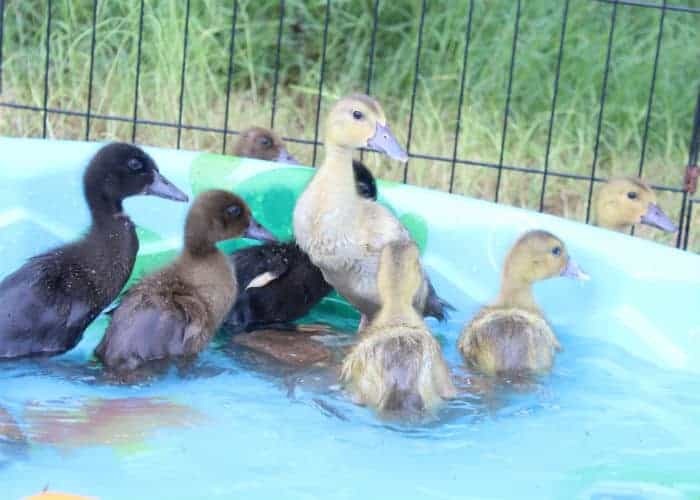 We now have 10 healthy ducklings. 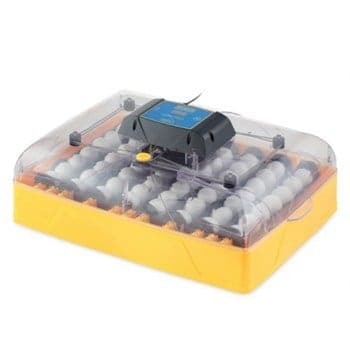 This incubator is very easy to use, and is as close to set and forget as you can get with an incubator, at least until it’s time to remove the eggs from the turning element to hatch. The temperature stayed the same the entire time, and the humidity was consistent as long as the water level was constant. The egg cups that are part of the turning element are easy to use, and accommodates our very large Pekin duck eggs well. For goose eggs, the manual recommends laying the eggs on their sides, which we had to do with a couple Pekin eggs. We noticed that the incubator did not draw a lot of energy, even though it maintained 99.6 degrees for well into 2 months, so it seems to be quite energy efficient. This isn’t bad per se, but more of a piece of advice: Consult the manual carefully and keep it handy when setting up the egg cups and automatic turner. In the confusion of the day 18 crash on our first test run, we panicked to get all the eggs back in the Brinsea Ovation 56 Advance Incubator as quickly as possible to avoid shrink wrapping. I had to consult the manual to figure out how to place the egg cups so they lined up with the automatic turning element because I completely forgot how they fit together, and it wasn’t 100% intuitive in the heat of the moment. If not set up correctly, you run the risk of the eggs falling out of the cups, which is initially what happened when I tried setting up the incubator for the 2nd test run. The eggs were unharmed, but it’s best to keep the manual on hand. The timer for the Brinsea Ovation 56 Advance Incubator automatic turning element is set to go off every 45 minutes by default, so be sure to consult the manual to select an interval that works for you. We set it to turn the eggs every 2 hours. We couldn’t figure out how to turn the beeping off completely for the timer, and it kept my husband up at night, but it didn’t bother me. If you’re a light sleeper, take this into consideration when deciding on a location for your incubator. Because we have special needs children and cats who get into things they shouldn’t, we kept ours in the bedroom where we could keep an eye on it. The heating element on top of the Brinsea Ovation 56 Advance Incubator isn’t easily removable, so it made it difficult to completely clean it between hatches. When I emailed my contact at Brinsea for help, I was promised a reply with the information, but didn’t hear back with instructions for cleaning around the heating element. GREAT – I love this incubator, and had great hatch rates. The fact that we got 5 healthy, beautiful chicks after the crash speaks to the quality of the product. I haven’t lost a single chick or duckling that hatched, and they’re all healthy. While a bit pricey for beginning chicken and duck keepers, the peace of mind and craftsmanship is well worth it if you plan to incubate eggs frequently. I plan to use the Brinsea Ovation 56 Advance Incubator again and again, and it’s my prime recommendation for a mid-priced chicken egg incubator.